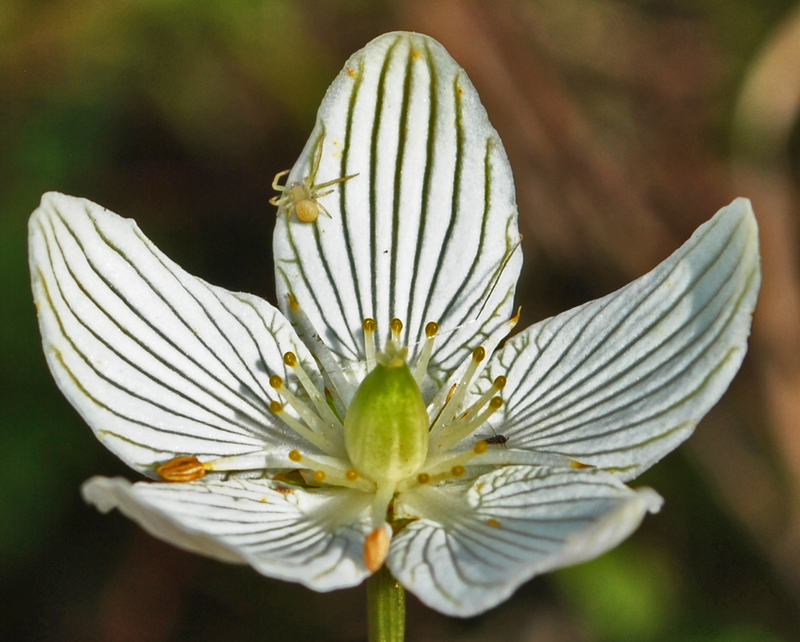 I’ve been on the Blue Ridge Parkway the last couple of weekends and have made it a point to stop at Wolf Mountain Overlook (Milepost 424) to check out the Grass of Parnassus, I believe to be Parnassia asarifolia. It’s easy to see how poets could become infatuated with this lingering summer beauty as she seems to simply project from the wet gray rocks, drinking in the sunlight and dancing in the spray of water. 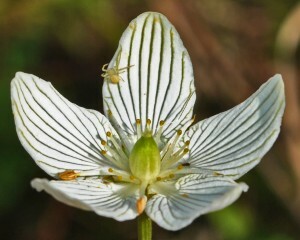 The rock face and seepage are also home to other wildflowers like the carnivorous sundew probably Drosera, rotundifolia, Michaux’s saxifrage, soapwort, Gentiana saponaria and, now gone – turtlehead, probably Chelone, lyonii. And while people’s attention is clearly focused upward this time of year, there’s still a lot of late summer/early fall color along the roadsides and forest trails. In fact, turtle’s head may still be showy in the forest – places like the Flat Creek Trail along Heintooga Spur Road off the Blue Ridge parkway. Stiff gentian, Gentianella, quinquefolia is quite prominent along the Parkway, especially near the Richland Balsam Overlook. Numerous species of goldenrod add their distinctive buttery-yellow hue to the panoramas. Some morning glories are still with us and a profusion of asters ranging from white, to cream, to blue, to purple sprout on the roadside or peek from the woody shadows. Red and blue berries of blueberry, green briar, holly, mountain ash, dogwood and others hang like Christmas ornaments from trees, shrubs and/or vines. Colors will soon dominate. Oranges, reds and yellows will overwhelm. But get out now – before the blinding cascade and search the shadows and the roadsides for the last American lady or Aphrodite fritillary sucking the last nectar from some aster or goldenrod and know that beauty is more than showy and/or opulent – that it can be found in the tiniest bee crawling on the tiniest flower, or the one glimmer of red berry shining from the deep forest shadows.